Picture of View through “Carved information as object”, 4 tonnes of Government documents, 250 x 250 x 600cm, sculpture by Graham Hay, photography by M. Lockhart. ​Fed up with the amount of paper in your life? 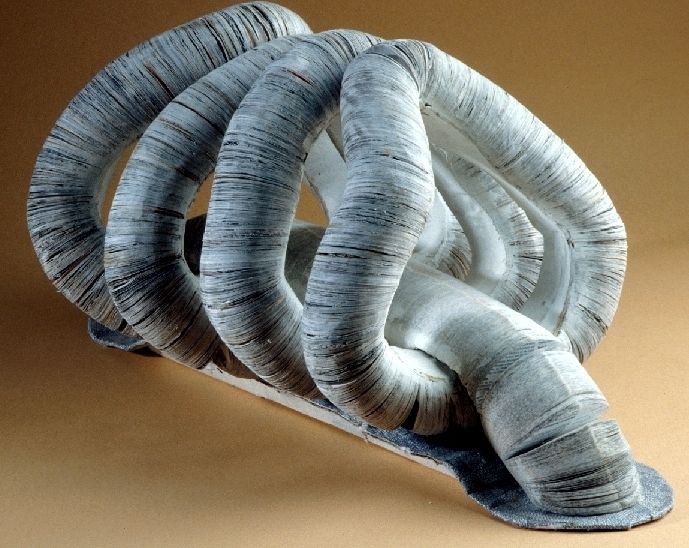 Graham Hay's solution was to develop techniques for compressing and carving documents into sculptures ranging from the handheld up to four ton installations. Here he tells his story…. Carving compressed documents is relatively straightforward, just like woodwork, provided the right tools and techniques are used. First however, the paper has to be collected. For me, the type of paper is important. Like collage artists, I prefer to recycle existing documents rather than just use blank paper. By using existing documents, I’m “sculpting information”, rather than sculpting paper. For me this distinction between content and medium is important. Documents may wait in my studio for some time, until inspiration finally suggests their final carved form. An example of this was a pile of misprinted reports from an enquiry into corruption in government, which waited for a couple of years before I was inspired to carve it into a large egg shape and title it “still born”, because its recommended checks and balances were unlikely to be fully read and implemented. Sometimes the ideas come first and I seek out the appropriate documents. For the Committed exhibition, I imaged “waves” of people visiting exhibitions at the Fremantle Arts Centre, over many decades. Phonebooks were collected from a recycler and cut into sheets with a single column of names. These were stacked into eleven metre-long “waves” down each wall of a corridor. Another “information installation” was at the 1998 National Sculpture Forum in Canberra. Having worked as a political lobbyist engaged in “paper wars” with the Canberra administration, I decided to create a huge paper spiral to suggest the flow of paper through the capital. The result was made from 60 metres of Annual Reports, Hansard and similar documents. The 4 tonnes of paper were stacked, drilled and threaded onto a spiralling steel pipe and installed in the foyer of the High Court of Australia. ​Each type of document has different properties, making it suitable for different processes. Issues of accountability ensure that company and government annual reports are the most durable, which also makes them the hardest to work with. The thinnest paper has been in a Chinese Bible. Phone books are relatively easy to cut with a bandsaw, unlike the pages of glossy magazines, which tend to fuse together when drilling and sanding, perhaps due to a high level of plastic sealant on them. Occasionally I have used my student notes, reports and even made up my own documents, before cutting them up. As a by-product of researching art school graduates, I have drilled core-samples through their graduation catalogues, before rebinding them into mini-book spinal forms. One of the nicest “image book forms” I made was from a catalogue of images for the advertising industry. Picture of "Grasp Gasp" (1995) by Graham Hay, machined and bound Art student exhibition catalogues & university handbook, 30 x 30 x 60 cm, Photo: Victor France. After collecting the selected documents and deciding on the sculptural form, colour is considered. It requires lateral thinking to visualise a document becoming a thick slice through the sculpture and the resulting surface colours. Consider only the internal colour of the publications. Individually coloured pages will not show up when compressed along with hundreds of other pages. A novel is a block or cube of grey (the text) “wrapped” in a covering of white (the margin). How this grey block is incorporated into the mass of the sculpture will determine what part of it is exposed, and the resulting surface colour. ​There are subtle differences in the colour of the paper in different publications. Some have blocks of the same colour on every page. The edges of these will show up as strips of colour on the surface of the sculpted form. Changing the order, rotating and flipping pages, before compressing them, will all change the surface colour of the sculpture. ​Combinations of selected publications will create bands of colour across the surface of the sculpture. The final strips of colour become a unique “barcode” on the work. This uniqueness is refreshing in an age of mass production and digital duplication. ​During the manufacture of high quality paper, a very fine layer of clay is incorporated into the paper to give a smooth printing surface. This clay will quickly dull wood drilling and cutting power tools, so I use metal and stone tools for these types of paper. Similarly, traces of the chemicals used to break down cellulose fibres still remain in the paper and its dust. Consequently I use industrial dust masks and work in a well-ventilated environment/outside. However, these drawbacks are more than compensated for by the environmental and economic advantages of recycling. Old documents are free, and high quality paper is difficult to commercially recycle because of clay and plastic additives. This high quality paper is also very durable, so my current project is creating a group of permanent compressed paper sculptures for the outdoors (this project is being assisted by a grant from the Australia Council). Picture of “Carved information as object” by Graham Hay, 4 tonnes of Government documents, 250 x 250 x 600cm, photography by M. Lockhart. 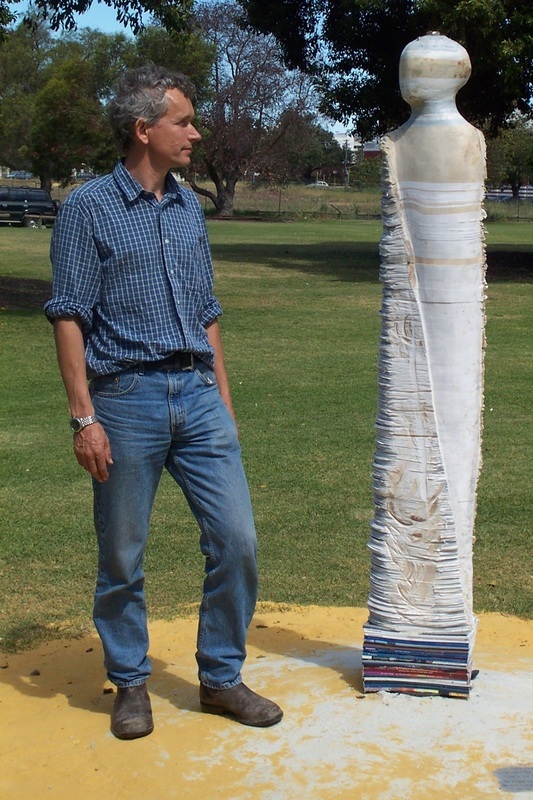 Picture of Artist Graham Hay with “Bureaucraft I” made 2002, an outside sculpture of Government documents, 200 x 40 x 20cm, Photo: Frances Dennis. WHY DO I CUT UP PAPER? My compressed and carved document sculptures are a reaction to, and a by-product of, information overload. With the increase in the cultural, social, financial and political complexity of our society there has been a corresponding increase in planning, communication, competition and regulation. All accompanied by their appropriate pieces of paper or virtual equivalent! I experienced this information/paper overload whatever I did - while studying, in an office job, in my art practise and in everyday life. The never ending pile of office work, junk mail, bills, invitations, correspondence, newsletters, “important pieces of paper” and clippings…. Increasingly, we formalise our interactions through text on paper. These bureaucratic processes are taking over my whole life. Not surprisingly, I exorcise my frustrations by cutting up documents! Once compressed, cut and sanded the tactile surfaces are so inviting that everyone wants to touch the paperwork. Maybe this is because the documents can’t be read, and therefore are safe to handle…. 1. View through “Carved information as object”, 4 tonnes of Government documents, 250 x 250 x 600cm, photography by M. Lockhart..
2. "Grasp Gasp" (1995), machined and bound Art student exhibition catalogues & university handbook, 30 x 30 x 60 cm, Photo: Victor France. 3. “Carved information as object”, 4 tonnes of Government documents, 250 x 250 x 600cm, photography by M. Lockhart. 4. 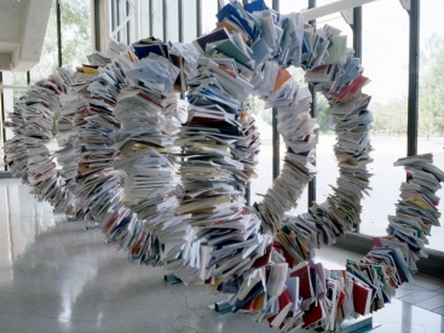 Graham Hay with “Bureaucraft I” made 2002, an outside sculpture of Government documents, 200 x 40 x 20cm, Photo: Frances Dennis.